We are located in the heart of Miami, On Pier 5 Slip 31 of Bayside Marketplace next to Bayfront Park and the new Miami Arena. Our location borrows from the past as it looks to the future. 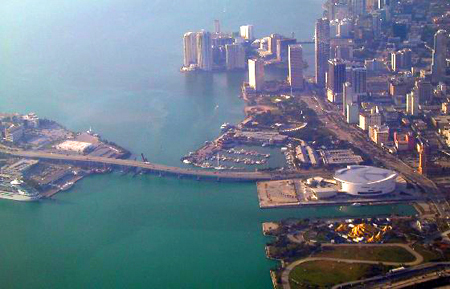 The original Pier 5 was Miami’s top tourist attraction in the 1950’s. Similar to San Francisco’s Wharf, it was a place for fisherman to dock at the end of the day, housewives to buy fish for supper, and other locals to congregate and talk. Here you can browse through shops and pushcarts selling everything from T-shirts to souvenirs. If you’re lucky, you may catch some live entertainment or enjoy the street performers bringing smiles to the faces of all those that pass by. From the North (North Miami / Fort Lauderdale) – Proceed on I-95 South to the Biscayne Blvd exit in downtown Miami. After exiting, continue straight ahead until street dead-ends into Biscayne Blvd. Turn left and head North on Biscayne Blvd. until reaching the entrance to Bayside Marketplace on N.E. 3rd St. Turn right into Bayside. From the South (Coconut Grove / South Miami) – Proceed on US1 North to Interstate 95 (US1 merges into I-95). Proceed north on I-95 to the I-395 East exit. Proceed East on Interstate 395 and take the first exit – Biscayne Boulevard. Turn right at the end of the exit and proceed south on Biscayne Blvd. until reaching the entrance to Bayside Marketplace on N.E. 3rd St. Turn left into Bayside. From the Miami Beach (NoBe / SoBe) – Proceed on Collins Avenue South to 5th Street in South Beach. Turn right onto 5th Street and proceed west over the McArthur Causeway leaving the beach. Take the first exit – Biscayne Boulevard. Turn left at the end of the exit and proceed south on Biscayne Blvd. until reaching the entrance to Bayside Marketplace on N.E. 3rd St. Turn left into Bayside.